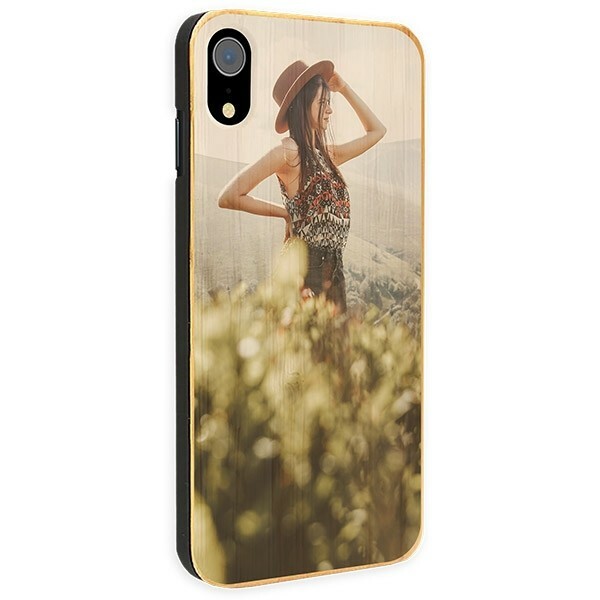 An iPhone Xr printed with a personal image on wood, it's possible with a custom iPhone Xr case. Use your phone images and designs to create a wooden phone case that offers great protection and looks great. Make your own custom phone case today in as little as five minutes. A phone case is necessary to protect your iPhone Xr from the daily hustle and bustle of modern life, but it doesn’t have to be boring. In fact, when you are able to design your own custom phone case, you can create a custom iPhone Xr case that matches your style and personality exactly. You are the designer now. If you want a phone case with a photo of your adorable pet, a phone case with an image of a fond memory with you and your family, or a case using a design that you love, you can have it. Only your imagination limits you. Our wooden phone case is a mixture of great protection for the back and sides of your phone while adding a natural touch with a bamboo back. Upload a photo and design your own phone case now. Creating a custom iPhone Xr case is incredibly easy, and in less than five minutes you can create a unique design that you will absolutely love. Upload a photo or design via your computer, phone, or social media account, resize or rotate it, then add texts or emojis to it. You can also create a collage of images in our Customizer. Any PNG, JPEG, or GIF format will work. Once you have finished your design, check it again to make sure everything looks the way you want it. When you are happy with the way it looks, check out. You’ve just designed your own custom iPhone Xr case! Very soon after you have completed your design and submitted your order, our product team will start working on it. To give you an idea of the process, our production team will pick the appropriate case type from our stock room. They will position it in a mold to make sure it is secure and then place it in the printer. Your design is then printed by our high-resolution printers using scratch-resistant ink. Once the print is complete our team will check to make sure there are no imperfections before boxing your custom iPhone Xr case up and shipping it to you. Order your personalized phone case now for fast delivery and a custom design you will love.